Rome's underground burial chambers and crypts cover a period of history that predates Christianity and post-dates the Renaissance. You’ll never believe what lies beneath Rome until you see it for yourself! This 3.5 hour tour takes you below the city and back to a time when Christianity was considered a cult, and its members were executed as heretics and buried as martyrs. The long corridors of the Roman Catacombs house hundreds of burial chambers, from modest single sites to extravagant family tombs. At San Clemente Basilica you’re in for some surprises. As you go from the top layer, which is a 12th-century basilica, you’ll continue down through a huge 4th-century basilica, a 2nd-century sanctuary of the mysterious Mithraic cult and, finally, to a well-preserved 1st-century Roman street, replete with herringbone tiling. 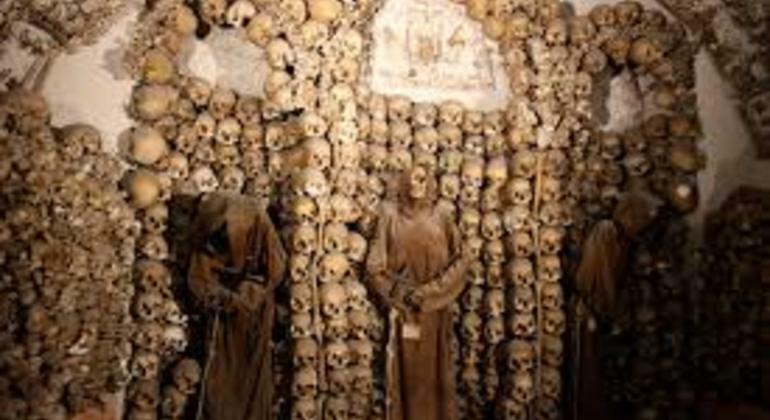 The biggest surprise of this tour, however, is the Capuchin Crypt. The recent addition of an official museum here means that your first encounter is with Caravaggio’s magnificent canvas called St. Francis in Meditation. You’ll see relics from the life of St. Francis and some of his followers here as well.